The cell cycle (Fig. 1) leads to cell division and duplication. In eukaryotes the process can be divided into 3 periods – the interphase, the M (mitotic) phase, and cytokinesis. While cells grow and accumulate nutrients during the interphase (a prerequisite for subsequent cell division), the cell splits itself during the M phase which results in 2 daughter cells which enter the final stage – cytokinesis (represented by 2 yellow cells in Fig. 1 at the end of the M phase). Cell cycle checkpoints control the process to ensure correct division of the cell. What happens during the sub phases? In G1 (Gap 1) cells increase in size. The G1 checkpoint control mechanism makes sure that DNA synthesis is well prepared. During the S phase DNA replication occurs. G2 represents the gap between DNA synthesis and mitosis, the cell continues to grow. The G2 checkpoint control mechanism makes sure that the M phase and cell division is well prepared. During Mitosis the cell division takes place, cell growth stops at this stage and cellular energy is focused on the orderly division into two daughter cells. A checkpoint in the middle of mitosis (Metaphase Checkpoint) makes sure that the cell is prepared to complete cell division. How do you measure the major phases of the cell cycle in cells? Biocolor offer a versatile method for live cell detection and measurement of the four major phases of the mammalian cell cycle. Fig. 2: Cell-Clock dye labelling of the four major phases of the cell cycle, obtained with live CHO cells, covered in a 2-4 mm layer of DMEM. Microscope magnification was x 400. The Cell Clock™ Assay uses a redox dye that is imported by cycling cells. 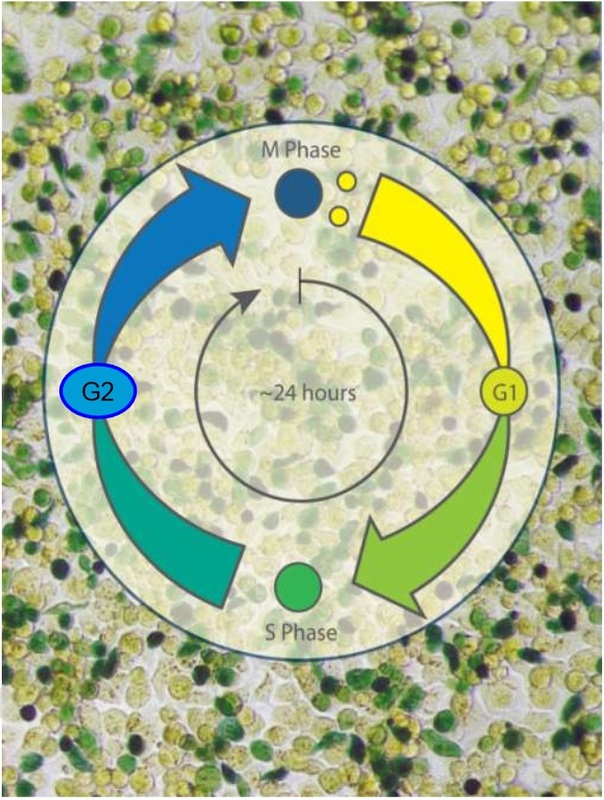 Following dye uptake and incubation a distinct colour change occurs within cells, with particular colour changes being associated with cells in the G0-G1, S, G2 and M Phases. The ratio of cells within the different phases can be calculated using this assay supplemented by visible evidence from photomicrographs. The calculation of phase ratios can be obtained by computer software analysis (ImageJ) of the digitised images of photomicrographs. No toxic effects of the Cell-Clock dye have been observed, the cycling time was unaffected. Fig. 2 shows typical results obtained with the Cell Clock™ Assay. G1 cell: Increases in size from a small, pale yellow, newly formed cell, circular in shape. If exposed to a cycle arrest agent the G1 cell can become swollen in size. 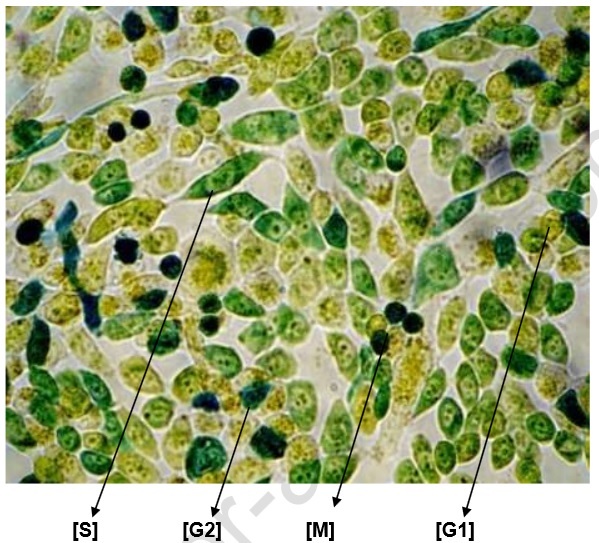 S-phase cell: An example of a cell about mid-way through the S phase. Note the paler labelling of the nucleus. G2-phase cell: During the G2 phase the cell becomes dark green in colour and will leave this phase as a blue cell. M-phase cell: The cell has entered the final phase of the cycle. The cell becomes intensely blue and undergoes a distinct morphological change. A M-phase cell takeson a dumb-bell shape that will quickly transform into two spherical cells. In control wells, without any externally added arrest agents, the Cell-Clock dye labelled M phase cells eject the dye to reveal a dye free pair of newly formed daughter cells. If you are interested in the Cell Clock™ Assay or would like further information, just leave a comment or reply below. Is the stain dependent upon the uptake mechanism of the live cells? Do the stain pass into the cells via diffusion through the cell membrane (e.g. in glutaraldehyde-fixed cells) or do the stain pass into the cells via specific uptake channels, or via pinocytosis (normal or induced), phagocytosis – or will it pass into live photoautotrophs like some green microalgae? now I got the answer from the lab. In fact the dye provided with the cell clock assay diffuses through the external membrane into live cells, so no active transport involved. Should you have further questions, please feel free to contact me (Ali.el.Baya@tebu-bio.com). thanks for your technical request concerning the cell clock assay. I will check with the lab and come back to you asap.